Can you please elaborate for our own education. I can understand that according to Rabenu Tam the Chatoterot is not a GAG. Therefore we would definitely invalidate a Chet where the Chatoterot begins from the edge of BOTH legs, as in such a case there is NO ROOF. But perhaps this a case is a bit different and there there is room to be lenient if one of the Zenins has a Gag although the other side appears as a Kav Pashut. I base the above on the makor of a CHET from RASHI where we are lenient (bedieved) even if there is not the shape of two ZENINS and no BELITA at the top. Do you think that maybe we can also be lenient here and allow correction if read as a CHET by a TINOK? 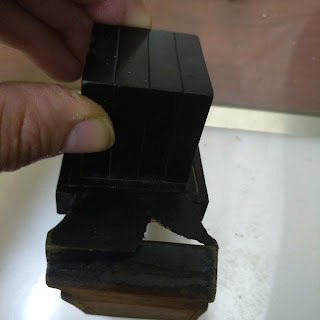 In such a case, perhaps one may be able to thin out the CHUTRA on the right side to reveal the head of the VAV in order for it to be satisfactory? Or in a Bet Yosef, allow to add a bit more ink to the right, without it being considered shelo kesidran? Or do we judge this letter strictly on the standards of Rabenu Tam who requires a ROOF over every YERECH of the CHET and invalidate it as such. After all, this is not a CHET SHEL RASHI, and one may argue that it needs to be judged solely by the parameters of a Chet de'Rabenu Tam. Your elaboration is very much appreciated. Thanks! 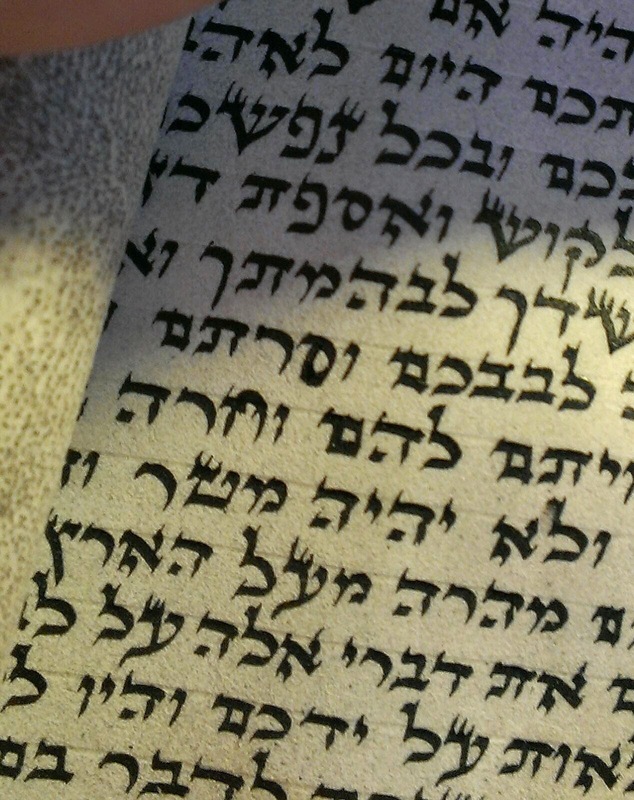 This question was already on the forum a long time ago, one of Yehoshua Deital's blogs. There he quoted Rabbi Shammai Gross shlita machshir, following part of the logic you give here. This is also in Mishnat hasofer or some example close to this ches. Therefore - The above is my opinion, and I will explain next note. maybe it was not Yehoshua, but it was on the forum. Yes I posted it and the conclusion was that it was fixable. 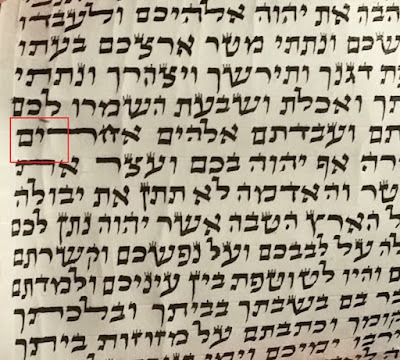 This ches is not a Rashi ches, neither a RT ches, therefore we cannot combine both shitos to make a third ches (half Rashi half RT) !! 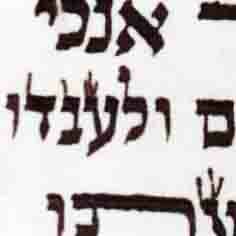 The right foot is a golem which is an accepted pisul, in related parts of letters, as yudin of alef etc. the same here the right foot is not a zayin or vav, rather a golem. Those that permit fixing a golem (Mikdash Me'at) may consider permitting here to fix by adding dyo (not scraping), since the letter [ches] is obvios. And so too fixable acc the tzemach tzedek by adding ink? I think the Lamed of the word "Al" on the third line from the bottom is a definite psul.